Wildland fire has and continues to impact humans and our environment both positively and negatively. Being able to co-exist with fire on the landscape is becoming increasingly more important as man expands his use of the world's ecosystems. 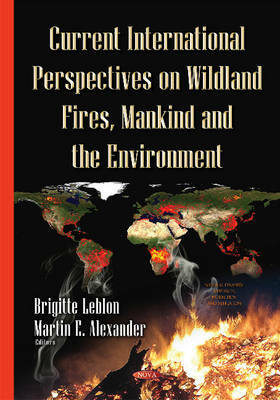 This book is the latest contribution dedicated towards the scholarship surrounding the subject of wildland fires. The present volume consists of a collection of essays covering fire science and technology topics that support the management of wildfires and prescribed fires written by specialists in their respective fields. The nine chapters cover the following: (i) the need of fire and the consequences of policies of attempted fire exclusion to try and manage the wildfire problem; (ii) a review of the current state-of-knowledge of the role of remote sensing technologies in managing wildfires; (iii) a description of how the Canadian system of forest fire danger rating has been introduced into Argentina; (iv) the rationale for adding an "QA" for anchor point(s) to the LCES (Lookout(s)-- Communication(s) -- Escape routes -- Safety zone(s)) safety system for wildland firefighters, thus denoting LACES; (v) a case study involving the use of cloud-based geographic information system on the 2013 Silver Fire in southern California; (vi) the deaths that have occurred amongst rural firefighters and members of the public in Greece since 1997; (vii and viii) two separate overviews of the history, ecology and management of two large Argentinian regions of South America; and (ix) an assessment undertaken of wildland firefighter fatalities in South Africa over the past twenty years or so.